Until 2010, Curacao was one of the six Netherland Antilles Islands. At present, Curacao forms a part of the greater Netherlands. However, they are not a part of the EU. They do enjoy the benefits of being in the EU without officially being a part of the EU. Indeed, this explains why Curacao is a popular destination for several companies. Likewise, the Curacao eGaming License is a top choice following its low rates and application demands. Also, Curacao eGaming happens to be one of the oldest in the world of online gambling. Since 1996, this regulatory body has been a top provider of regulatory compliance among several top brands. Even more, the services of the Curacao eGaming is not limited by borders. Hence, companies from all over the world take advantage of the low tax rates to get the Curacao eGaming License. Indeed, the Curacao egaming offers lots of professional services. In the end, they are responsible for ensuring that all license holders maintain proper integrity and conduct. The first step is to indicate interest by sending an application. The applicant shall provide all the necessary information as required. Afterwards, the report shall be reviewed before the application can proceed. Furthermore, applicants must submit the completed IP application request form along with other relevant documents via email, courier or in person. The application team will only commence on processing the application upon receiving proof of payment. In case of approval, applicants must make all the necessary payments before the license is finally issued. Finally, periodic compliance audit is conducted from time to time to ensure compliance from license holders. 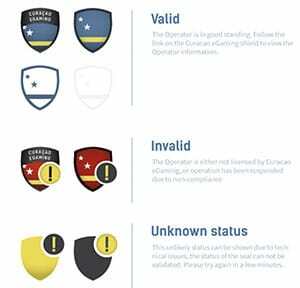 So far, many online casinos with poor reputations are most often than not regulated by the Curacao eGaming license. There have been issues of unresolved disputes and several other player complaints. Another major concern is that many of the online casinos that have this license somehow can accept players from the UK even without a UK license. We always list what affiliates have in terms of a license. Of course, there will always be two sides of a coin. If you are looking for a cheap and easy license, this is a good option. However, they do have reputation issues that may also affect your business. A great brand that has the curacao support behind it is Split Aces Casino.